Alright, you all know I had a Maria V. Snyder Extravaganza weekend, and I intend to rub it in for a few more posts, but I thought I would share this with you now. Because I know you'll put up with me rubbing it in fantastically, and because I/Maria V. Snyder/ the Dorsch Memorial Library (and Jadin the librarian) are so awesome, I have an early Christmas/[insert holiday of your choice] present for you: I am going to give you a chance to win one of the books I have been crowing about. Maria kindly donated some signed copies of her books to the library, and Jadin ^ kindly passed one on to me to pass on to you. 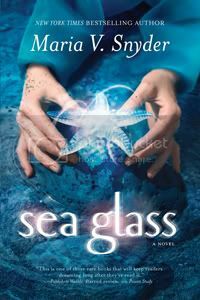 So I am offering a signed copy of Maria's latest book, Sea Glass (#2 in the Glass series) to one lucky winner. Want to win? All you have to do is leave a comment with your name and a way to contact you, and tell me why you want it. Why is this book on your list, why does it catch your eye, how happy would it make you, etc. +1 for thanking: Maria V. Snyder, Dorsch Memorial Branch Library, the Books with Bite book club, and Jadin, the librarian! Contest ends December 1st at midnight EST, so the book will be on it's way to the winner as a nice early Xmas present. I would love to win this because I really enjoyed the first book in the series! Great contest, I would enter if I didn't already have the book. OH MY GOSH. I am entering because I absolutely loved her Poison Study series, and am super stoked to know that there is a second series out. Plus, it's signed! +3 - I follow you on google reader already! I would love to read this book - I keep hearing such great things about Maria V. Snyder. I'll do my best to remember to comment on your review. +3 Already a follower, I'd love to win this! I would love to enter! I read Poison Study by Maria V Snyder and was blown away so I want to read more by her! I'd love to win this! I am a big fan of the first series, and really enjoyed the first installment of this one, too! Maria's novels are great! +1 I became a follower! +1 for thanking: Maria V. Snyder, Dorsch Memorial Branch Library, the Books with Bite book club, and Jadin, the librarian! ~~~ I think this is done and done and done!!! Thanks I have been wanting to read this and this one is signed. Hello I commented on your review-Do I need to read Storm Glass first? I do follow your blog, but would love to read Sea Glass. Yes, Esme, I would definitely recommend reading Storm Glass first. If not, you will be COMPLETELY lost for a good portion of the book. And I +1 because I just become a new follower! +1 The cover is really caught my eye. I would love to read it and then pass it to my sister. Well, that's nice and familial, Bekki. I just finished Poison Study and loved it so much that I will be reading everything by this author. Thanks to you, Maria, the librarian guy, the library and the book club for the chance to win the book! Oops. *blush* Jadin is obviously not a name I've come across before. I apologize. This book look really good! I love to color of the cover and the idea is very original! I'd love to win this! I actually just put the first one on hold at the library yesterday. It's been a series I'm really looking forward to starting at some point in the near future! Thanks for this awesome contests! I've heard that Maria V. Snyder's book are great! !